Liverpool secured a convincing 3-0 victory over Stoke City as the Reds travelled home with the three points. 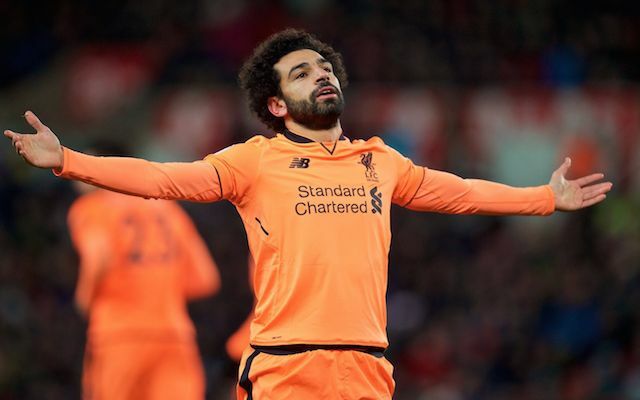 Mohammad Salah was rested for tonight’s fixture but was introduced to the game with just 20 minutes remaining and managed to register two goals for himself. Sadio Mane also registered a goal after being rested from the starting line-up during Liverpool’s clash with Chelsea last weekend. Liverpool secured a convincing three points against Stoke City thanks to goals from Mohammad Salah and Sadio Mane. Salah was the star of the show despite only featuring for 20 minutes after being rested on the bench by Jurgen Klopp. The scoreline may be unfair to Stoke who remained competitive until Liverpool’s second of the match. Liverpool were just one goal ahead until the 77th minute and Stoke had numerous opportunities to draw level. It was the introduction of Salah who entered the field on the 67th minute that proved to be the difference. Klopp opted to field the likes of Dominic Solanke in tonight’s fixture to rest key stars but still turned to the Egyptian Salah to seal the three points. Both of Salah’s goals were more than impressive after a fine volley on the 77th minute was added to by a superb finish just six minutes later from the winger. Mohammed Salah was superb and shone above every other player on the pitch despite playing just 20 minutes. It really does show how important the Egyptian has become for Liverpool when he is able to shine while playing just a fraction of the game. Combined with his fresh legs and outstanding pace Salah was simply too much to handle for the Stoke defenders who were already tiring before the introduction of the winger. Bruno Martins Indi struggled throughout and was exposed the moment Salah was introduced to the action. The Dutchman picked up a yellow card on the 65th minute and had to tread incredibly carefully during the last 25 minutes of the match to avoid seeing red. Liverpool: Mignolet 7, Gomez 6, Matip 6, Lovren 6, Moreno 6, Can, Wijnaldum 6, Oxlade-Chamberlain 5, Firmino 6, Mane 8, Solanke 7. Subs: Milner 7, Salah 9, Henderson n/a. Mo Salah with 17 Goals for Liverpool and it’s only November. Scored against Arsenal, Chelsea banged 2 on a wet and windy night at stoke, scored a last minute winner to send his country to the World Cup. Is there anything this man can’t do. Football as a new super star ?? Salah is the best thing to happen to Liverpool since Suarez/Torres with potential to be even better. Goal scoring machine. Hes not even a striker.